Representative Jeff Shawan, a Republican, represents all of Carter and Ripley counties, and parts of Butler and Wayne counties (District 153) in the Missouri House of Representatives. He was elected to his first two-year term in November 2018. Prior to joining the legislature, Shawan was a business owner in Missouri and Texas for more than 20 years. He also served as Emergency Management Director for Butler County. Shawan is a lifetime patron member of the NRA. He attended high school and Three Rivers College in Poplar Bluff. 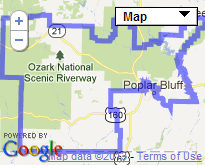 Born in Cape Girardeau, Shawan currently lives in Poplar Bluff with his wife, Christy. They have three children.